Some people like the clean, flat look of drywall. It’s cheap, easy to install and finish and the repairs are relatively painless. But, like most old home fans, I like the unevenness of plaster walls. Besides its durability and sound deadening properties, plaster adds mass and character to a wall. It also looks more interesting in side lighting. 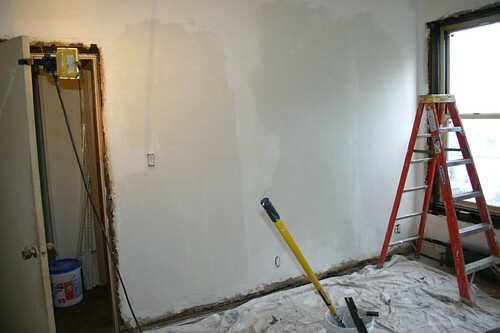 Unfortunately, plastering is also one of the hardest construction skills to master. When I took possession of my 1906 house, one of the first things I drew a bead on was the ugly paint texture in the entry hall. It looked like dripping candle wax or possibly the work of the sloppiest house painter ever. It was done with oil-based enamel too so it wouldn’t scrape off. Sanding was the only alternative but I didn’t relish doing that with what was almost certainly lead-based paint. Another alternative was skim coating but skim coating is the black belt of plastering skills. I knew I lacked the skills for that, or so I thought until I ran across a nifty tool with the dubious name of Magic Trowel. I’ve got a box full of useless Magic Things I’ve bought over the years so I was skeptical. But the principle behind it seemed sound (as it usually does, unfortunately). 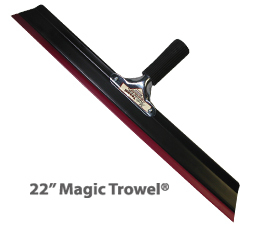 Magic Trowel is basically a squeegee with a deeper blade and angled cuts on the end. These features are what makes it work as a skim coating tool instead of a window washer. The deeper blade tends to force the mud against the wall rather than scrape it off and the 30 degree cuts on the ends eases the tension and feathers the edges. Using the tool is remarkably easy, if messy. You thin a five gallon bucket of joint compound with a cup of water, mix it up, roll it on the wall with thick napped paint roller, then smooth it out with the Magic Trowel. I skimcoated my entire living room in about an hour. And it looked great! Since my maiden attempt, I’ve learned a few tricks. First, joint compound is basically just liquefied dust. It’s not nearly as hard as plaster so thick applications will have a tendency to dent. I tried to fix this by adding gypsum plaster to the mix but that mostly just reduced the set time. I discovered a better product called Setting-Type Joint Compound. It applies like joint compound and is nearly as hard as plaster but it’s much easier to work with than plaster. Working times are as long as 90 minutes. Another trick is to clean the wall first with TSP, then lightly sand it with 100 grit. Then paint the wall with a plaster bonding agent like PlasterWeld. Read the instructions carefully. You want to begin skimcoating before the bonding agent has completely dried. Don’t obsess over gouges and dents. These can be fixed later with compound and a taping knife. It’s more important to go quickly and not overwork the wall. Regardless of how naturally talented you are, you’re almost certainly going to need to sand the wall after it has dried. This is incredibly messy so make sure to seal off the room and use an exhaust fan in a window to create negative pressure in the room. And of course, work with goggles, a mask and a side light to catch the high spots.